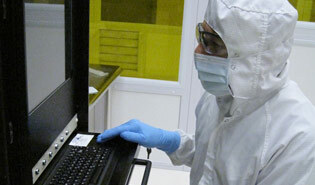 Our PECVD oxynitride is a unique film that is widely used in the fabrication of MEMS and opto-electronic devices. PECVD oxynitride is mechanically stable and possesses optical properties that make this film ideal for building waveguides and integrated optical circuits. PECVD oxynitride is also used in during MEMS device fabrication to build mechanical structures. Our PECVD oxynitride is available in any refractive index target from 1.48 to 1.88. Since PECVD oxynitride has a low film stress, it can also be deposited at greater thicknesses than our standard PECVD nitride.